CAMPARY -- CudA Multiple Precision ARithmetic librarY: multiple precision arithmetic routines for GPUs, developed in CUDA C by/with the help of: Mioara Joldes, Olivier Marty, Jean-Michel Muller, Valentina Popescu and Warwick Tucker. Currently supports basic arithmetic operations. Freely available. Unifapprox: Maple code for Rigorous Uniform Approximation of D-Finite Functions (solutions of ordinary differential equations with polynomial coefficients) using Chebyshev Expansions. Developed by Mioara Joldes, Alexandre Benoit and Marc Mezzarobba. Freely available. GloptiPoly 3 - Moments, optimization and semidefinite programming. Matlab parser for generalized problems of moments. Allows to build and solve convex linear matrix inequality (LMI) relaxations of the (generally non-convex) global optimization problem of minimizing a multivariable polynomial function subject to polynomial inequality, equality or integer constraints. Can be freely downloaded and used. Developed by Didier Henrion, Jean-Bernard Lasserre and Johan Lofberg (ETH, Zurich). R-RoMulOC - Randomized and robust multi-objective control toolbox for Matlab. Modeling and robustness analysis based on LMI techniques. Works with parser YALMIP, all control problems are solved by SDP solvers such as SeDuMi, CSDP, DSDP, SDPT3... Can be freely downloaded and used. Main developer: Dimitri Peaucelle. HIFOO - A Matlab package for fixed-order controller design and H-infinity optimization, using a hybrid algorithm for nonsmooth, nonconvex optimization based on quasi-Newton updating, bundling and gradient sampling. Can be freely downloaded and used. Main developer: Michael L. Overton (Courant Institute, NY). The Helicopter setup consists of a base on which a long arm is mounted. The arm carries the helicopter body on one end and a counterweight on the other end. The arm can tilt on an elevation axis as well as swivel on a vertical (travel) axis. Quadrature optical encoders mounted on these axes measure the elevation and travel of the arm. The helicopter body, which is mounted at the end of the arm, is free to pitch about the pitch axis. The pitch angle is measured via a third encoder. 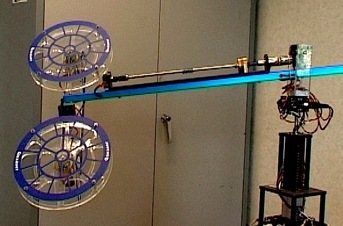 Two motors with propellers mounted on the helicopter body can generate a force proportional to the voltage applied to them. The force, generated by the propellers, causes the helicopter body to lift off the ground and/or to rotate about the pitch axis. All electrical signals to and from the arm are transmitted via a slipping with eight contacts. The system is also equipped with a motorized lead screw that can drive a mass along the main arm in order to impose known controllable disturbances (the so-called Active Disturbance Option, ADO). This Helicopter is a Quanser product.